Activists who want to stop oil and gas production across the country have often claimed that natural gas will somehow “crowd out” renewables. But new data from the Energy Information Administration (EIA), once again, completely debunks that point. 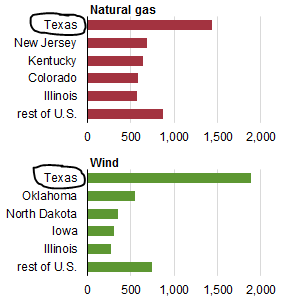 According to EIA’s database, Texas continues to lead the nation both in natural gas and wind power generation. How would that be possible if activists’ claims were true? Texas accounted for more than one-third of the new wind and natural gas-fired power added to the nation’s electric grid this year through September, according to the data. More specifically, Texas accounts for twice the amount of New Jersey, the second in new gas power generation, and triple the amount of Oklahoma, the second in new wind generation. Through advances in hydraulic fracturing, natural gas has provided clean, affordable and reliable energy for Texas consumers as the state and the country continues to decrease greenhouse gas emissions. 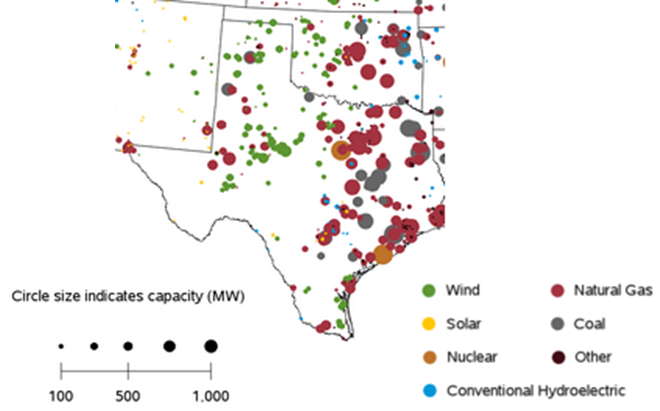 The below color coded map from EIA shows how natural gas (shown in red) has transformed and wholly penetrated the Texas electricity grid with high megawatt power generation. The growth of natural gas – and renewables – as power sources is far from over. According to a Capacity, Demand and Reserves report released earlier this month, the Electric Reliability Council of Texas (ERCOT) added 6,250 megawatts to the outlook since the previous report in early May, including nearly 1,600 megawatts of new natural gas-fired generation and almost 3,200 megawatts of new wind generation capacity. The report also includes additional electricity demand from the Freeport liquefied natural gas facility, which is currently under development on the Gulf Coast and is scheduled to be fully operational in 2019. Back in 2013, the Texas Clean Energy Coalition analyzed the short and long term relationship between natural gas and renewable resources in the Texas electricity market – and what they found was a “win-win for Texas and the environment.” Two years later this reality still rings true.